Like other accoutrements, the shoulder slung carbine sling was a necessity. It was designed to enable the cavalryman to carry a long arm while mounted yet kept his hands free to make his choice of other weapons, either the pistol or saber and, all the while, hold the bridle reins to control his horse. In the event he was fighting dismounted as he was increasingly skilled to do or, became “unhorsed”, provided he survived the fall, this accoutrement still allowed the trooper ready access to his weapon. 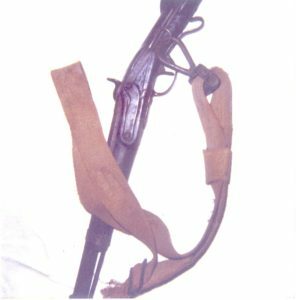 The ideal carbine sling throughout the war was that used by the Federal cavalry and found in the 1861 Ordnance manual described as black (bridle or buff leather).-Length 56″, width 2.5″; one buckle and 1 tip (brass), swivel and D with roller, bright iron, 2.62 inches wide; link and hook, iron; guard-spring, steel.” 1. 2. Regulation Federal issue carbine sling with brass buckle and tips and iron snap hook. Photo Courtesy Ken McPheeters. For the South, early in the war individual troopers, their supply officers and state ordnance officials no doubt utilized all manner of slings to carry their shotguns or what few carbines they had available. As the Confederate government increasingly took control of manufacturing, it is clear ordnance officers all over the Confederacy generally tried hard to copy the pre-war Federal Ordnance regulations when making equipments of any kind. The issue of the 1863 Confederate Ordnance Manual, a nearly identical reprint of the Federal 1861 manual, provided some better guidelines. However, what was actually made and issued was often quite different from the regulations and apparently varied widely across the South. Due to variances in manufacturing capacity, material shortages and access to imports the Confederate eastern, western and Trans-Mississippi departments reacted differently to the challenge of supplying carbine slings to their troops. EASTERN CONFEDERACY: As the eastern Confederacy’s principal army, the Army of Northern Virginia (ANV) was predominantly supplied through the centralized Richmond Arsenal system. For most accoutrements this included a heavy dose of manufacture at the bureau’s large harness shops at Clarksville Va., the depot in Richmond, a network of other Virginia Depots, some contract manufacture as well as an unclear amount of British imports. Like many photos of CS cavalrymen the carbine sling of Sgt Philip Thomas, Co B, 14th SC Cavalry (& also Co E, 5th Regt SC Cavalry) has the narrower width. However, too many conclusions should not be drawn from surviving photos. Widths of leather and web and certainly hardware varied widely. Sgt Thomas is carrying a Jenks sidehammer carbine. The narrow sling has a D ring, and a small adjustable strap with a snap hook attached to it that was in turn clipped to the ring on the carbine. Photo Collection, U.S. Military History Institute, Carlisle, Pa.
From surviving correspondence and records we note that early war carbine slings made through Richmond were of black or russet leather apparently often with brass buckles and tips at least similar to the high quality Federal pattern. However, as shortages quickly ensued significant modifications did also. For example, narrower widths were common. Then, as leather became expensive and scarce, heavy cotton webbing was purchased or imported as a replacement. 2. Near the end of the war bureau correspondence suggests that even enameled cotton cloth “as in osnaburg or duck” was used to some degree, “…Amount consumed by this depart(ment) is enormous. It is used in almost every way as a replacement for leather in manufacture of infantry, cavalry accoutrements, gun slings, canteen straps, etc.” 3. In addition, for several reasons including closer proximity to the bureau’s main port of entry at Wilmington NC, Richmond received the lions share of imported equipment. Which likely included carbine slings of English cotton web or slings similar, if not identical to British army issue. 4. No doubt Federal captures also augmented supply. Mississippi Pvt James Secrest, Jeff Davis Legion, Army of Northern Virginia. It is not clear when or where this photo was taken but a close up of Pvt. Secrest and his Gallagher (Maynard?) carbine apparently shows a sling made of cord or rope. Photo courtesy H. Grady Howell, Jr.
A review of ANV cavalry inspection reports from 1863-1864 generally finds a greater percentage of carbines in use such as Sharps, Smith, Merrill, Richmond and others rather than rifles or muskets. Although individual units varied widely, Virginia troops also tended to be armed with more carbines than their ANV brethren from North Carolina, Georgia and elsewhere. Notations in the reports about the carbine sling as an accoutrement are largely incomplete, at best vague and therefore inconclusive. In the end, records indicate the bureau was apparently quite successful at providing this item to trooper’s in the field. From April 1861 through January 1st 1865 some 115,087 gun & carbine slings of all kinds were issued through the Richmond Arsenal system. 6. Early war photo of a Sgt. from “Bolivar Troop, 1st Mississippi Cavalry Battalion with Maynard Carbine. Note the narrow carbine sling that employs a common link strap style snap hook. See insert. Several members of this unit were photographed. All with identical hats, clothing, accoutrements and arms. Photo Courtesy Herb Peck. The Maynard Rifle and Carbine in Confederate Service by Howie Madaus, American Society of Arms Collectors Bulletin Number Fifty-Two, 1985. WESTERN CONFEDERACY: In the west, the procurement methods for carbine slings (like rifle slings they were sometimes referred to simply as “gun slings”), contrasted sharply with that in Richmond. Some eleven arsenals and over a dozen depots were spread across six states to serve a constantly shrinking geographic area and widely scattered commands. Unlike the more centralized system in Richmond, manufacture by sub-contract was prominent across the western Confederacy. Severe material shortages, transportation and communication difficulties greatly impacted a contractor’s and therefore, an arsenal’s ability to provide consistent numbers. Arsenal commanders were often left to their own discretion in regards to patterns, materials used and quality. 7. For carbine slings this meant dozens of individual contractors providing slings of, no doubt, very inconsistent appearance. As in the east, the carbine sling similarly evolved however, in the west this occurred to varying degrees at the different arsenals and often at a far more accelerated rate. For example, many contracts let in 1862 were apparently of high quality and often included brass buckles and tips while others were not. 8. By 1863, more convenient replacements for leather were gradually found such as cotton webbing. 9. By wars end, other expedients may have also included folded, stitched and enameled canvas and even, Spanish Moss. In contrast to the ANV, a review of inspection reports for Forrest’s and Wheeler’s cavalry in 1863-1864 generally find more infantry weapons such as Austrians, Mississippi, Enfield and Springfield rifles rather than carbines. Again individual units varied. While the inspection reports make only occasional reference to “guns slings”, it is clear from contractor and arsenal records that significant numbers of carbine and gun slings were made and issued. 10. TRANS-MISSISSIPPI CONFEDERACY: Records regarding the manufacture of carbine slings are virtually non-existent. In fact, definitive records for any accoutrement piece manufactured in the Trans-Mississippi (TM) is scarce and therefore inconclusive. However in general, a study of the department’s supply system including imports and their domestic manufacture of arms, clothing, leather, etc. can provide some insight. Texas Cavalryman uses a web sling with interesting snap hook variation that utilizes one-half of a “snaffle” horse bit and a wire spring snap like that found with the Federal pattern link straps. Note the roller buckle adjustment, leather chapes and billets. Courtesy Jerry & Teresa Rinker. Leather was certainly readily available in the TM but sophisticated or plentiful manufacture of brass or iron was not. Arsenal facilities were few and far between and their manufacturing capacity was limited by material, machinery and labor shortages as well as incredibly difficult transportation issues. Imports from England via Mexico augmented general supply somewhat but its impact for accoutrements was likely minimal at best. 11. Furthermore, there is reason to speculate about the need or desire for carbine slings. Cavalry operating west of the Mississippi River was decidedly individualistic in arms, dress and discipline. Most accounts of TM cavalrymen paint them as varying from uniformity of any kind. Various descriptions show them with their arms slung across or to, the pommels of their saddles or across their backs. Some likely made their own extant version of the carbine sling. 12. In short, for the Trans-Mississippi cavalryman it is doubtful neither organized manufacture or import of carbine slings was plentiful. Author’s Note: It was very common for Confederate cavalrymen in all theaters to be armed with infantry weapons such as muskets or rifles like the Enfield, Austrian Lorenz or Mississippi and often, shotguns. Instead of using a carbine sling these arms would simply be carried using the weapon’s shoulder sling, slung over the trooper’s shoulder and across his back. Interestingly, the record for a number of early war contractors in the west show the specific supply of “shot-gun slings” but their appearance cannot be ascertained. 13. LEATHER: High quality carbine slings would have followed ordnance manual specifications as far as possible. Nevertheless, photos and archival records suggest narrower widths were very common. 14. (Photo #14) Bridle, harness or buff leather was commonly employed. As for color, the tanning method and source of leather supplies often dictated the color. In the Confederacy, black dyed leather was preferred by the Ordnance Department however variations of “russet” colors appear to be more readily available. For example, most leather supplied by southern tanneries was oak tanned either stained a brown color or dyed black depending upon time and cost. Dyeing leather black (using iron mordants) was an additional step apparently not always taken. Contract tannery delivery receipts denote occasional reference to black leather but usually make no distinction at all. Some leather was also oak tanned “fair” or, left to its natural yellow color. Leather imported from England was also oak tanned, “stained” to varying shades of brown but probably not routinely dyed to black before being shipped through the Blockade. Interestingly, there is evidence the South purchased some quantities of leather from the north immediately prior to and even during the war. Large amounts of northern leather was Hemlock tanned in the 1850’s and 1860’s. The Hemlock tanning process left a red cast color (not a true brown) unless it was “cheated” to look black. Unfortunately, even cheating the dye process did not last very long before it returned to its natural red/brown or chocolate brown. In summary, while black was the color of choice, russet brown was probably more commonly used for carbine slings. 15. Field modified British import? Interesting white cotton web sling (webbing approx. 62 in. long and 1.25 in wide) with British snap hook variation from an old auction catalog of Confederate artifacts. Note the lack of buckle adjustment assembly. WEB: The variable use of web belts and straps in different weaves and thicknesses was very common all over the South throughout the war. White cotton web was made by several firms including Hughs, Pendergrass and Snows (“Shoulder belts… 1 3/4″ wide… containing… 500 threads”) and some was also imported from England. Leather chapes and billets would be routinely employed around hardware for durability. 16. CANVAS DUCK OR OSNABERG: Folded in 3-4 layers, stitched and enameled (using lamp black & linseed oil) cotton canvas slings were durable, pliable and water proof. Again leather chapes & billets would have been routinely utilized. 17. Collector’s note the survival of at least one other sling variation made from heavy cloth with a brocaded, floral tapestry of approximately one and three quarter inches wide. Though faded brown from time this Spanish Moss made carbine sling boasts a crude cast iron snap hook, buckle, brown leather billet strap and keeper. It is attached to a cut down Confederate marked Belgian musket. Photo Courtesy Author. HARDWARE: Higher quality, early war carbine slings certainly used cast brass buckles and tips similar to Federal patterns. Clearly, brass shortages and manufacturer’s constraints necessitated the use of other extant hardware too, such as cast roller or horse shoe buckles or, even hand forged buckles. It is of interest to note that contracts let to hardware suppliers in the western South rarely show buckles for widths over 1.75″. 18. The significance of this is not certain but it is worthy to note that hand forged flat iron buckles of consistent pattern and approximate dimensions to sling buckles have been excavated from western war-time sites. CARBINE (GUN) BOOTS (Holders): The typical Federal issue carbine boot was a small, open-ended cylinder shaped piece of leather with attachment strap and buckle. It was designed to buckle to the “D-ring” of the saddles’ off-side (right) quarter straps. While mounted, the trooper snapped his carbine to the sling snap hook putting the gun barrel down into the boot to both stabilize the weapon and to provide easy access. References to carbine or gun boots are found in the surviving records for the Richmond Arsenal and for many western contract suppliers. 19. While very commonly made and issued, sadly, any description of the Confederate boot , if it differed from the Federal pattern, cannot be found. SNAP HOOKS; Snap hooks for the Confederate sling presents a special problem. Mass production of the finely machined, steel, spring snap with roller made by the Federal’s was apparently beyond the ability and /or desires of the Confederate Ordnance Department. Yet, it is clear some type of metal snap hook was provided with each of the thousands of carbine slings issued. Photos of cavalrymen indicate variations of common period link strap hooks or rein snaps were often employed. Other sophisticated and crude versions of snap hooks are occasionally found (See photos #5 & #7) and British imports also augmented supply to some extent. Unfortunately, no description for a common issue Confederate pattern snap hook, if one existed, could be found. In conclusion, the Confederate manufactured and issued carbine sling with its snap hook and boot provide us with a microcosm of the South’s overall supply predicament. Like other military equipment, early in the war the South tried hard to copy the Federal patterns as close as possible with their available resources and, they were at first, very successful. Soon material shortages and a lack of manufacturing abilities quickly gave way to expedient replacement of materials and alterations of patterns. Federal captures and foreign imports played some part in augmenting supplies too however, by wars end, crude but resourceful substitutes were apparently common. While on the surface this may seem desperate, it actually shows the wonderful flexibility, ingenuity and dedication of the Confederate Ordnance Department in its remarkable effort to keep its army supplied. History has proven the Southern cavalry as among the finest and most innovative light horse cavalry in the world. The carbine sling, while only one accoutrement was an important contribution to the function of this versatile, fighting horse soldier and therefore, his well earned reputation. AUTHOR’S SPECIAL THANKS: To Coley Adair (Critter Company), Bill Adams of Connecticut, David Jarnigan (C & D Jarnigan), Doug Kidd (Border States Leather) and John Nolan of Pennsylvania without their inspiration, expertise, assistance and photo contributions this article would not have been possible. Files of the firms of R.S. Crenshaw; Rhodes, Wilson and Hurt; Hughes, Penderass & Snows. Firms having contracts or business with the Ordnance Department for the manufacture of equipments during the war, M346, Confederate Papers Relating to Citizens or Business Firms, (Hereafter: CPRCBF), IBID. 4. Mike Chappell, British Cavalry Equipments, 1800-1941, Osprey’s Men-At-Arms Series (London: Ospry Publishing Ltd., 1983), 3, B, C, D.
Lawrence James, Crimea, 1854-56, The War with Russia from Contemporary Photographs. Van Nostrand Reinhold Company, NY, NY, Scarborough, Ont., Canada, 1981, Pgs. 51, 57, 63. 5. Inspection Report of several ANV cavalry brigade’s and divisions, 1863-1864. Inspection reports and related records, Inspection Branch, Adjutant and Inspector Generals Office, Roll #4, M935, NAWDCCR. 6. Work performed by the Richmond Arsenal July 1861 through Jan. 1st, 1865. Richmond Enquirer, 1st April 1865. Original copy in Josiah Gorgas Family Papers, Series 678, Folder # 9, Hoole Special Collections Library, University of Alabama, Tuscaloosa, Ala.
7. Ken R Knopp, Confederate Saddles & Horse Equipment, Publisher’s Press, Orange, Va. 2001. Pgs 75-84. 8. Files of the firms of Joseph Gue: Houston & Rose. Firms having contracts or business with the Ordnance Department for the manufacture of accoutrements during the war, CPRCBF, NAWDCCR. 9. Hughs, Pendergrass & Snows, CPRCBF, IBID. 10. Inspection Report of Forrest’s and Wheeler’s Cavalry Divisions, 1863-1864. Inspection reports and related records, Inspection Branch, Adjutant and Inspector Generals Office, Roll #4, M935, NAWDCCR. 11. Ken R Knopp, Confederate Saddles & Horse Equipment, Publisher’s Press, Orange, Va. 2001. Pgs 85-87. 12. Stephen Oates, Confederate Cavalry West of the River, Univ. of Texas Press., Austin, Tex., 1961, Pgs 60-71. 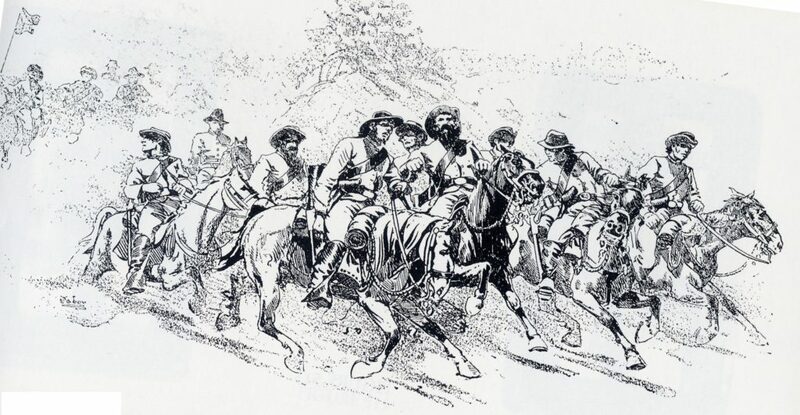 J.P. Blessington’s Campaigns of Walker’s Texas Division, 16th Texas Infantry, May 28, 1863. Further verbal references too numerous to list. At least one photo of an ANV cavalryman has a soldier employing a cord or rope. Ken R Knopp, Confederate Saddles & Horse Equipment, Publisher’s Press, Orange, Va. 2001. Pg. 45. 13. Files of the firms of J.O. Ford & Co.; F.E. Pleitz.CPRCBF, NAWDCCR. Inspection reports often show shot guns sometimes even late in the war. Cavalry Inspection Reports and Related Records, 1863-1865, Inspection Branch, Adjutant and Inspector Generals Office, Rolls, 2,3,4, 6,8,9,10,13,15 and 18, M 935, IBID. 14. Surviving photos and widths of buckles provided by contractors strongly suggest narrower widths were common. Reviews of hardware contract suppliers, M. Russell & Co.; Rhodes, Wilson, Hurt; Claiborne Watkins,CPRCBF, NAWDCCR. 15. Several dozen leather contractors including William Kimble, David Jordan, J J Hudson, OH Chaukly, William Beal, William West and more. CPRCBF, NAWDCCR. David Jarnigan, Hemlock Leather- The Federal Ordnance Department’s Other War. Journal of the Military Collector & Historian, The Company of Military Historians, Washington DC., Vol. 57, No. 1 — Spring 2005. Two other as yet unpublished articles by David Jarnigan and Ken R Knopp contain new information about war time leather production. The second in the series of three is titled “Secrets of the 19th Century Tannery” and the third “Confederate Leather: Black or Brown? How & Where?” concerns Confederate leather tanning and production. 16. Contract between Atlanta Arsenal and Hughs, Pendergrass & Snows, March 3, 1863, Contracts for Ordnance Stores, Atlanta Arsenal Records, Vol. 78, NAWDCCR. Many other domestic firms provided web and sizeable amounts appear to have been imported from England where there was a large industry employed making webbing. 17. War Dept. Circulars, Richmond, Oct. 26, 1863; Feb. 17, 1864, Records of Ordnance Bureau, Entry 39, IBID. 18. Reviews of hardware contract suppliers, M. Russell & Co.; Rhodes, Wilson, Hurt; Claiborne Watkins, CPRCBF, IBID. 19. Pride to Gogas, Sept. 19, 1863, Henry Pride File, #203, Military Service Records, General & Staff Officers, IBID. Files of the firms of Joseph Gue: Houston & Rose; N. Smith; Winn & Co.: Peck & Jones; Charles P May. Firms having contracts or business with the Ordnance Department for the manufacture of accoutrements during the war, CPRCBF, IBID. ABOUT THE AUTHOR: Ken R Knopp, is the author of two books, “Confederate Saddles & Horse Equipment” and “Made in the CSA, Saddle Makers of the Confederacy” as well as numerous articles about Civil War saddlery, Confederate leather and accoutrements. He is a Financial Advisor with Edward Jones Investments in Columbia Mississippi.